SING&SEE is software that shows what your voice is doing while you sing. The software listens to your singing, analyses the sound, and instantly displays what pitch you are singing, and other features of your voice. SING&SEE is software that analyses the voice - while you are singing - and displays information about your singing on the screen. The first critical aspect of singing is pitch, and the pitch display screen presents the pitch of the voice in a clear and musically relevant format. Of course, singing is nothing without resonance (timbre, color, ring, or any number of other descriptors for the "quality" of the voice tone) and this reveals itself in the spectrogram. In the pitch view, the exact pitch of your voice is shown while you sing. You can see what note you are singing on the piano keyboard and stave - this can help in learning to identify the sound of your voice with specific notes. You also see a line that mirrors how your pitch moves with time as you sing a single note or a range of notes. The continuous line allows you to see visually the control of pitch, and even details such as vibrato and how easily you move from one pitch to another. The pitch tracing shows you how accurately you achieve each pitch, how smooth the onset to the note is, and also how the vibrato in your voice appears. The spectrogram shows you the timbre of your voice - the visual display representats the harmonic structures in the voice and how it changes while you're singing. This display provides a visually rich picture of the voice's character over time, including vowel shapes, singer’s formant, twang, breathiness, voice onset, vibrato, and pitch variation. 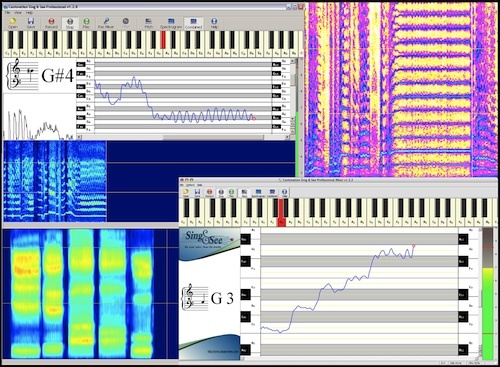 In singing, the spectrogram shows how the pattern of harmonics change as you sing different vowels or otherwise change the timbre of your voice. It also shows how "bright" your voice is (the so-called "singer's formant" or "ring") - this comes up as a band of bright color in the middle part of the display (between the two horizontal lines). 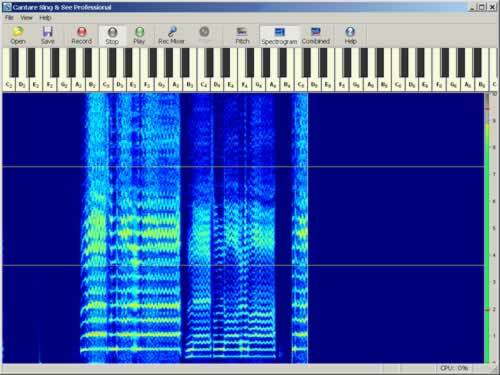 The spectrogram shows the pattern of harmonics in your voice. Time proceeds horizontally, and higher harmonics are represented higher on the vertical axis. The brightness of the color indicates the strength of the harmonic at that point in time and frequency. The two horizontal lines show 2kHz and 4kHz - below 2kHz the patterns are generally dependent on what vowel you're singing; while between 2 and 4kHz is the region of "singer's formant" (sometimes called "twang"). Find out more about the features of the SING&SEE software. We have developed several versions of SING&SEE for different needs, whether you're a beginner, professional singer, or teacher.